So, why are OUR HDMI cables priced so reasonable? Read on... Also listen to this short clip of Bob O'Donnell & Ronald Rosberg (ABC Radio/KSFO), host of the award-winning O'Donnell on Technology radio program, on what he had to say about My Cable Mart. I am confused by all the different connection types. What works with what? I am completely NEW to HDMI. What can you tell me about this technology? Why are YOUR HDMI cables priced so much cheaper than ALL the rest of the competition? So, are your $8.00 cables the same as the $80.00 cables? Some web sites claim their cables are "better" because they using a thicker gauge wire, and thus have less resistance resulting in a better signal. Is that true? So, why does your competition sell the cables for more? What is the purpose of this? If I buy an HDMI cable from you, how do I know I am getting the best possible HDTV signal? What if I buy an HDMI cable from you guys, and it doesn't work? What about "shielding"? I see some your cables are "double shielded". Some of your competitors are "triple shielded"
What about versions of HDMI? Do I need to be concerned about this when buying a cable? HDMI 1.3a, Category 2, Deep Color. What kind of HDMI cable do I need? I am seeing some cables saying they now support "120Hz" or 240Hz. Do your cables support 120Hz and 240Hz? 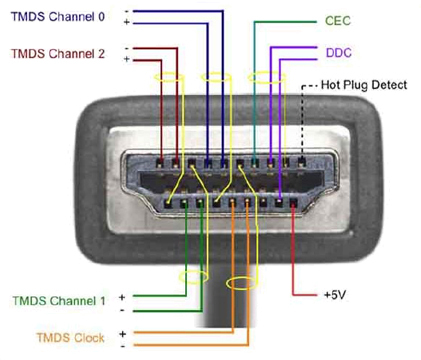 We have a connection guide that shows all the possible HDMI, DVI, and VGA connections that are possible. While HDMI is always a digital connection, DVI can be digital OR analog. VGA is always analog. Click HERE for our connection guide. HDMI is the de facto standard digital connection for consumer electronics products. Over 460 manufacturers will ship nearly 60 million HDMI-enabled devices in 2006, with a projected installed base of over half billion HDMI devices by 2009. We purchase our HDMI-HDMI, and HDMI-DVI cables directly from the manufacturer in bulk. What exactly is "bulk"? Yes, by the container load of thousands of cables. Instead of marking them up 500-1000% like some retailers (both bricks and mortar store, and some on-line stores - you know who you are), we mark them up to make a reasonable profit instead. Our cables are packaged in "OEM packaging" which is far less expensive than equivalent retailed packaged cables that typically sell for ten times our price. So, are your $6.00 cables the same as the $80.00 cables? Thicker gauge wire for LONGER lengths is needed to minimize signal loss due to natural resistance that copper has in a wire. Silver coating is also part of the manufacturing process for all our HDMI cables. All of our cables are purchased from an HDMI certified manufacturer. This means that the cables have been submitted for testing and certification. We have copies of the HDMITM certification document on file. All of our shorter length (3 to 16ft) cables are 28 AWG (American Wire Gauge), and will support ANY HDTV resolution, as well as support ANY device using an HDMITM connection. Cables that are 20 to 39ft are 24 or 22 AWG, and so on. Most of our HDMI (and HDMI/DVI) cables have ferrites to eliminate any outside radio interference. Most are triple shields - some are only double-shielded. All have silver-coated conductors. All are guaranteed to support all HDTV formats (1080p, 1080i, 720p, 720i) except where specifically noted. All our cables are RoHS compliant. All have 24K gold plated connectors to resist corrosion. All Supports 8-channel digital audio on same cable. Also supports 6-channel, 96kHz audio. All of these specifications are basic specifications that a manufacturer must meet to be certified. HDMI (and DVI) use technology that transmits an encoded digital signal from a source (such as a satellite, cable, or DVD player), to a target (such as an LCD or PLASMA TV) in a similar manner that computers communicate using TCP/IP. If you plug an HDMI cable in, and you see the resulting picture on your HDTV, the transmission was successful. If there is ANY failure in an HDMI cable - there will simply be no signal at all - resulting in a black or blue screen on the target HDTV. So, an HDMI cable either works 100.00%, or 0.00%. We sell over 6,000 HDMI cables each month. Our defect rate for HDMI cables is one of the lowest in the industry at 0.02%. We guaranteed our HDMI cables for LIFE, and provide immediate replacements. What about "shielding"? I see your cables are "triple shielded". "Fatter cables do not necessarily mean better signals. 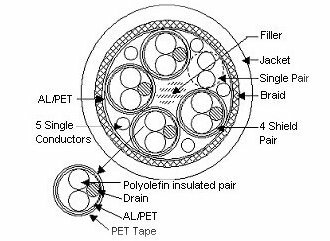 Previously, fat cables were deemed superior because the copper was thicker and the cables carried more shielding. Additional shielding reduced the likelihood of interference between the copper strands, which led to a better signal. "In the world of digital cables, there's no need for shielding since there is no possibility of interference within a cable. As for the thickness of copper, however, thicker copper will be able to extend the length of a digital signal, but for shorter cable lengths (two meters and under), there is no need for overly thick copper strands. In fact, thicker cables can sometimes be problematic since they are less flexible to bend around sharp corners and the increased weight can cause them to fall out of vertically mounted connectors." "I advise consumers to never focus on the specific version of HDMI, but rather, on the feature set of the device, such as 1080p capability, DVD-Audio support, etc. In fact, looking for the version of HDMI supported in a product does not mean that all the latest features possible from the specification are actually implemented in the product. So again, the key is for consumers to seek the feature, not the specification. Periodically, if you use longer lengths (ie greater than 65ft) of HDMI cable, and use HDMI wall-plates, switches, or splitters, the HDMI signal weakens to the point that the signal can be "lost". The use of an HDMI signal enhancer/booster then might be needed. We offer a 100% money-back guarantee that the HDMI-HDMI or HDMI-DVI cable will perform as advertised. If the cable does NOT work, you can either return it for a refund, or allow us to provide a replacement cable. Your choice. I am seeing some cables saying they now support "120Hz/240Hz". Do your cables support 120Hz or 240Hz? The 120Hz - and now "240Hz" is an electronics feature found in some newer LCD and plasma TV. This TV feature interpolates frames and inserts them between the normal frames to help remove, or "smooth out" video that would normally appear "jerky". 120Hz technology doubles the frame rate from 60 to 120 frames per second without repeating the same image to make more frames. 240Hz technology quadruples the frame rate. In both case, the TV intelligently calculates the 'middle' image between frame A and frame B and inserts it in between, making a fluid transition from one frame to the next. This technology has NOTHING to do with the cable itself. Some cable vendors are misleading customers and promoting "120Hz or 240Hz technology" as a cable feature. It is NOT. So, to answer the question - ANY quality HDMI cable will support the 120Hz or600Hz feature found in newer TVs. Want more information about 240Hz? PC Magazine have an excellent article on the technology itself. "There's a lot of "Hz" specs and claims out there. Don't even waste money on cables that claim to be "120Hz" compatible just because you have a display capable of refreshing at 120Hz - it's just marketing hyperbole. Any HDMI 1.3 compatible cable can support the higher bandwidth made available by the HDMI 1.3 spec. That bandwidth can be used to carry expanded gamuts, higher bit depth color, higher resolution than 1920x1080, or a higher frame-rate than 60Hz..."
** Cables of lengths of greater than 50ft may not support 1080p without the use of a signal booster. Check the specifications on the length of cable you are interested in. "HDMI, the HDMI logo and High-Definition Multimedia Interface are trademarks or registered trademarks of HDMI Licensing LLC.". 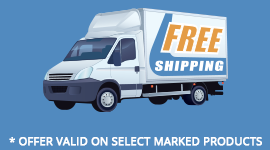 All products sold by MyCableMart.com are purchased from certified HDMI Adoptors (distributors and/or manufacturers). Customers wishing to see any certification documentation for such products can make such request in writing. Our HDMI cables are guaranteed for life, and meet HDMI 1.4a or 1.4b standards, & are RoHS Green Certified!